Article first published as Book Review: ‘The Martyr’s Blade’ by Joel Manners on Blogcritics. “The Martyr’s Blade” by Joel Manners begins with the news of terrible violence in the North, as announced by the Temple’s Priest to Lady Danielle. As disturbing as it is, the Priest reveals his biggest fear…this violence might be a sign that the Crunorix has returned. This revelation marks the beginning of this epic adventure where the reader will embark on a dangerous journey with Lady Danielle, Lord Bradon, a Knight named Killock, and a loyal thief, Wyn, along with their tracker, Torbhin. Their goal is to investigate and determine whether this revelation is true and fight to end the violence in Albyn, thus saving their world from this evil force. During their journey readers will face horrible creatures, and witness devastating violence against the villages and Temples; as the characters get to know each other better, readers will also experience the romantic tensions between them and find this read to be a page-turner all throughout its 582 pages, for sure! The story is presented within different focal points, organized into different chapters. Each chapter has the relevant character’s name within the scene. I loved this format as it made the multi-scene plot flow perfectly. Manners’ writing style is impeccable. His descriptions were vivid, his characters were colorful and engaging, and his plot was captivating, suspenseful and filled with action. My only complaint was that the dialogue felt a little repetitive, with some over-editing. This did not happen often enough however to affect my opinion about this book, and I only mention it here because I must report what I find on my review. 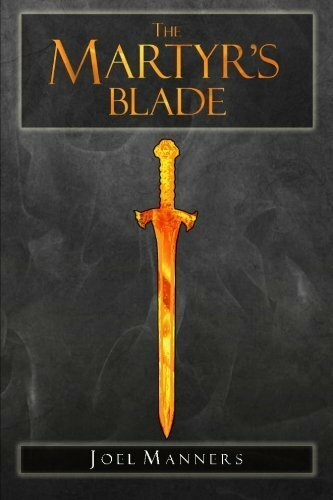 Overall, I found “The Martyr’s Blade” by Joel Manners to be an impressive first novel worthy of five out of five stars as an epic fantasy read that the audience will find very difficult to put down. Manners has definitely won me over personally, as a fan that will wait impatiently for the next book in this series. I am sure I will be one in a multitude!